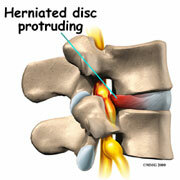 For three months now I have been suffering from back pain due to a lumbar disc hernia. That basically means that a disc in your spine – instead of staying nicely in its place between the vertebrae – slips out and messes around with the nerve roots leaving the spinal cord. It is pretty painful and the treatment is “wait and see” and hoping it gets better unless you have severe symptoms indicating nerve damage. Most physiotherapists or chiropractors will not even come near you for any treatment, let alone manipulation, and will only recommend careful mobilisation. Since you can neither sit, sleep, or exercise properly, it becomes something of a drag. So you stand. But even if standing is supposed to be healthy, 10 hours a day of it is pretty tiresome. The muscles are in constant spasm and you end up moving around like a stick. It doesn’t help your mood either. It was in this state, wearing a brace, that I entered the practice of one of Melbourne’s best physiotherapists. He took a careful history, performed his examinations, and then set off treating me using only his hands. The treatment was rather painful, but very effective. I danced (carefully) with the kids that night for the first time in three months. Although he had a specific idea of what he was treating and why, the exact hows of the movements were determined right there and then. To know precisely how much you can push at a spot or pull at a muscle, how much nerve tingling you can tolerate and when it becomes dangerous, is something he probably wouldn’t be able to explain exactly. True experts are like that, their knowledge is tacit, they simply “feel” what they need to do. Patricia Benner described the process of developing from novice to expert in nursing (1984), now a widely used theory on professional development. The novice needs simple rules of thumb and predetermined ways to treat a certain problem. After many years of reflective practice it is possible to become an expert, where taking on complex problems is a welcome challenge, a promise of flow. As a novice it is rather frustrating to try to learn from an expert because they often cannot provide simple and straightforward explanations to why they make this or that decision. They’ll tell you it feels right. But to watch them work is inspiring, whether you see a lawyer or an anesthesiologist in action. I remember the time when I was a junior doctor at an intermediate care unit where we had patients who were not sick enough for intensive care, but too unstable for the wards. I cared for a woman with chronic obstructive lung disease: she had an infection and was gradually getting worse. Her heart rate increased, her blood saturation slowly decreased, and fear filled her eyes. I glanced nervously over at the head physician of the unit, sitting doing rounds with the nurses and my colleague. I had already told him that I needed to consult him, but he said to wait until after the rounds. My patient sat up on the bedside, her nostrils widening with every breath, lips turning purple, blood pressure rising. Not good, I thought. But how not good? I went over to the head physician and told him he had to come. He stood at the patient’s bed, put his hand on her sweaty forehead, took her pulse and the patient seemed to calm down, easing herself into his big palm. He then turned to me, his hand still on the woman’s forehead and told me in a quiet, but firm voice. “Get a bed at the intensive care unit. Now.” Within ten minutes she was on a respirator. To trust your instinct is a good start. But to just know exactly what’s right takes an expert. The good news is that reflective practice – constantly analysing and evaluating your experiences to build new knowledge – can get you there one day. In the meantime, try to watch an expert work whenever you can. As for me, I have my next appointment with the expert’s hands to look forward to.